This place is a real gem. We only stayed 1 night but would have liked to stay longer. The sites are very spacious, level, and shady. We got #45 next to the gazebo, it was long enough to not have to unhook truck. They actually mentioned that when giving us the spot. All the grounds are well kept and neat. It's a couple of miles from the interstate so it was quiet and very relaxing. The owners were very pleasant and really seemed to care about our time with them. This will definitely be a stop on our next trip through the area, hopefully for a longer stay. We stayed here on our way to the Black Hills. What a great campground. Host was super friendly when booking and upon arrival. Bathrooms and showers were very clean. With the campground being approx 2 miles off hwy it was very quiet. 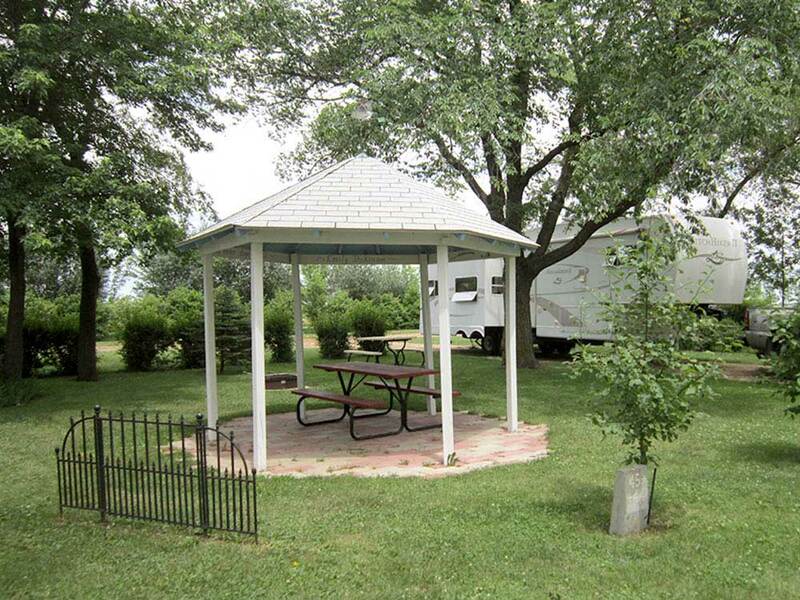 The Sites and campground is very well maintained. Would absolutely stay here again. We have a 18 foot trailer but there were large RV's there as well and they have pull through sites to accommodate them. We found this Camp America Campground meets all of our top campground requirements. Easy aproach from main Highway(I-90) Very very Clean in both facilities and grounds. Large, easy to enter/park pull through with well placed and maintained hookups. Very friendly staff. Homey grounds with flowers in planters, picnic tables and a unusual mini golf course with a flying saucer and space ship. Lots of space between each lot. We stayed 2 nights and hope to return. We were in site 45 which was spacious with gazebo. This was an overnight stay for us (but would love to stay there longer in the future) and had lots of room to leave truck hooked up. Would have liked to rate at 4.5 stars related to by-the-minute charge for use of shower. Easy access from I-90. Staff was friendly. Very well maintained campground. Owners takes pride in their property. Very clean restrooms. Level sites. This is a nice clean campground. The sites are large and level and the restrooms immaculate, The campground host was kind and very helpful. When I called for a reservation she asked if I had a satellite dish and where it was located on my motor home. This is the first time I have been asked this and I was impressed. I highly recommend this campground, only watch where you step as there are four cats roaming around that don't bury their business. Excellent campground! The sites are nice and level, well maintained and very roomy. The restrooms/showers are extremely clean, you can tell they take pride in their campground. The host were very nice and very helpful. I would highly recommend this campground. From Jct of I-90 (Exit 364) & US-81: Go 1.25 mi N on US-81 (L).